Every tool that sets out to kill email ends up sending it instead. This is a guest post by Mathilde Collin, the CEO of FrontApp, who are happy Intercom customers. Mathilde read our previous article the future of email, wrote a follow-up article asking why innovation in email is so hard, so we invited her to share her thoughts on the subject here. Email is an incredibly powerful tool, diverse and resilient. Email is easy to use, fast, delivered instantly all around the world. Email is cheap: send one or a thousand for – almost – the same price. Email is an effective marketing tool, allowing for direct conversations between companies and customers. Email is standard, open, universal. It’s been around since before the web, since before the Internet, in a sense. Email is the Swiss Army knife of our online activity. 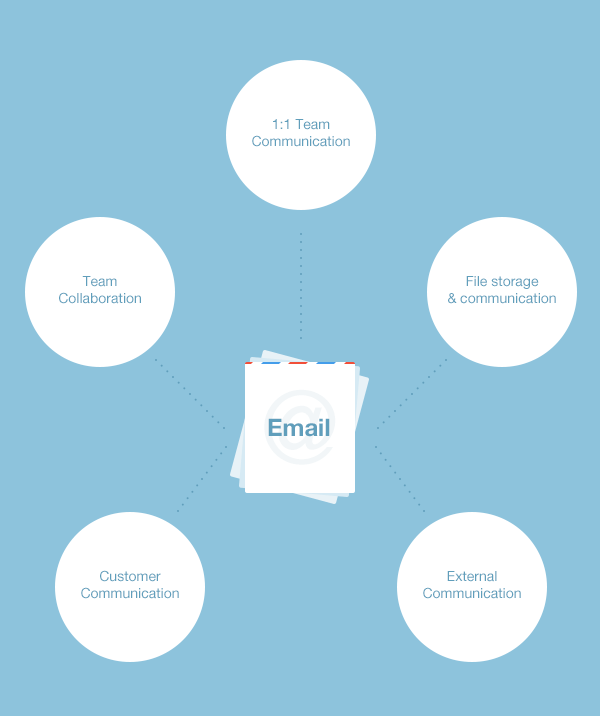 We use it for personal communication, collaboration, file storage, customer support, as a calendaring tool, a marketing channel, and much, much more. For all these applications, email just works, but most of the time it is not perfectly suited for the task. The same goes for a Swiss Army knife. It’s a good tool when you don’t know what you really need and have to cope with various situations, but as soon as you need something more specialised, you have far better options. A chef won’t cut meat with a Swiss Army knife; a carpenter won’t work wood with a Swiss Army knife; etc. They quickly turn to the best tools available to practice their arts. 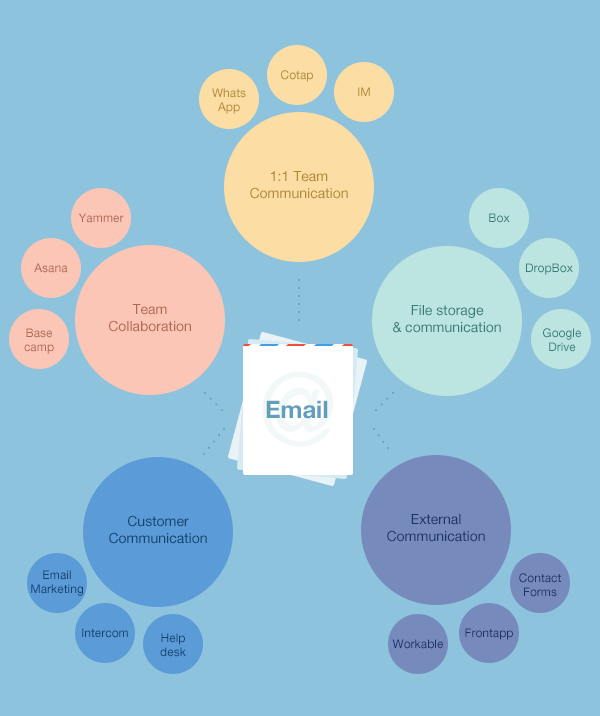 Email is a handy tool to quickly take care of all of this, but it is far from ideal. As time passes and a business grows, email is more and more ill-suited for those tasks. Actually, many companies have noticed how email gets twisted and bent and decided to provide us with better alternatives. Here are my favourite picks. As you go deep on any given use case, the need for structure arises quickly. For example, email ‘works’ for recruitment, but doesn’t work as well as Workable. Email ‘works’ for sending invoices, but not as well as a purpose built invoicing tool. The more specific you understand any given job, the better equipped you are to design for it. Here’s some examples. When you work on a project with a team, you’ll maybe use email to make requests, ask questions, remind each other what everyone is working on, and send documents back and forth in a never-ending table tennis match. But you’ll soon get lost, trying to piece together critical information, unable to decide what to focus as the signal-to-noise ratio plummets. The tools you are looking for are things like Slack, Yammer, Asana, Trello or Basecamp. Everyone, at some point, has sent empty emails to her own inbox, with some kind of attachment to keep track of the current state of a file, share it with others, and access it from another device. That’s not the ideal way to handle files. You’d better put them into a structured, searchable, tool – maybe one with some access management capabilities. A tool where files can be shared and modified more easily than email typically can. This is Box, Google Drive, Dropbox, etc. Email is a privileged channel for connecting with prospects and customers. During the first months of your company you can use it and you should use it. But as soon as your business grows, it becomes really hard to scale and you’ll need to find products to reduce your workload. You can use email marketing tools to send thousands of emails and track the results, and products like Intercom can automatically message your users as soon as they meet certain criteria. Every time an email is sent to one of your company addresses (contact@, support@, job@, sales@, press@ etc. ), it will probably be redirected to every team member involved with the matter. This is when the mess starts: no one knows who said what to whom, it usually ends up in dirty CCs, failed BCCs, unaddressed client requests, and so on. If you receive a high number of emails on one of these inboxes, specialized software like help desks for customer support or recruitment softwares should take care of this load for you. If you’re looking for a light solution to keep every team member in the loop, you should definitely use Frontapp. 1-to-1 email communication actually covers two very distinct forms of communication: personal and professional. For personal communication, email has already been replaced by social solutions like Facebook, Whatsapp, Viber, and the rest. The benefits of those services over email are clear to all. But for professional conversations, I think email is still dominant. It’s the default professional means of communication, it’s standard, and it’s expected. There are new mobile business products such as TigerText and CoTap, and side features of existing products such as Slack & Yammer that offer an alternative. However, any alternative is inevitably non-universal, and will fall back to email notifications, which is why why email will remain. And you’ll receive it right away, because you’re hooked 24/7 to your email inbox: it’s still the go-to solution for professional 1-to-1 conversations. So while email may unbundle from a jobs and workflow perspective, it will be ever-present as the most universal reliable notification channel, upon which the new products will be based. Mathilde tweets as @collinmathilde, and writes on the Front blog. 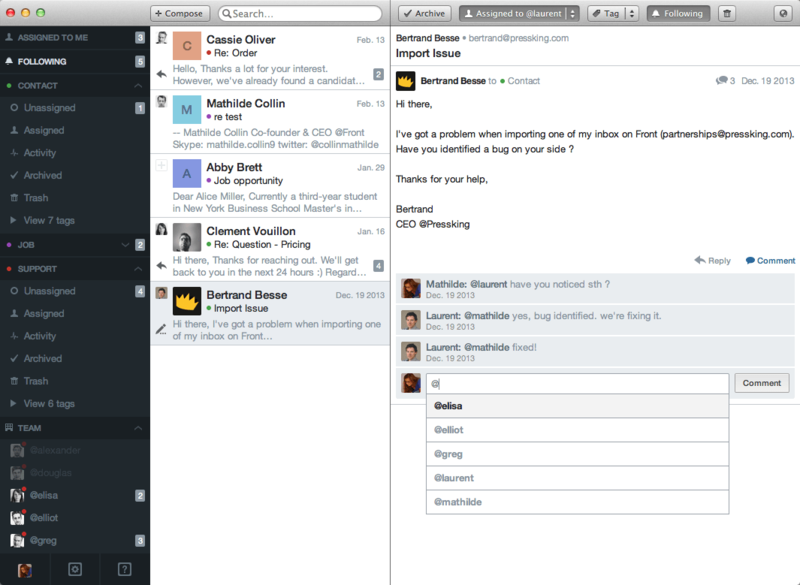 Front is a product for letting teams manage a shared address, for more information check out the Front website.